Ken's T-shirt & BMW fails. I am not sure which came first - the t-shirt or the remark by Ken Robinson during his talk about ways to stimulate creativity. Still fresh even though it was recorded three years ago. But note how mind-bogglingly dull the BMW 'ad' which now follows it. It is everything which TED is not supposed to be. The ad ends with what sounds like a comment from the pr people that that was a "pretty good line". Er, no it wasn't. Took a break from some rather complicated video editing to read a column in German following a tweet from Tomi Ahonen. It is a comment by Heike Scholz on Lufthansa's experience with the mobile industry. I hope I have captured the essence of what she says in German. Just read the following on the MTI blog, which, I recommend adding to your feedreader. If you opt for Mobile and you are somehow involved in the travel industry check out these recommendations from Lufthansa, which has eight years of experience in the mobile industry. I can only underline these findings from my own experience. 1. Management support is essential for the implementation of mobile strategy and projects. 2. Mobile services are not simply a miniature version of the regular website. You should ensure that applications and usability are adjusted to fit the mobile users. 4. The usability is the key to everything: fast and easy, optimized for different devices. Lufthansa stresses however, that not all devices available in the market should be optimized (for cost reasons). Smartphones or high-end devices (about 65% of people using the Lufthansa sites are users of the BlackBerry or iPhone) are now the focus of the developments. 5. Start with core functionality and then gradually add new features. 7. Search engines are a complement to mobile marketing campaigns. 8. Use specialists and experts as consultants for the mobile strategy and the implementation of the services . I should add to point 6. The marketing of new services or applications should be as cross-media as possible, and for an extended period and not purely during the campaign. Depending on the audience being targeted, Social Media Tools are also important. Just having a link to it on the company website or an application in App Store to advertise the service is not enough! I would add that point number one is vital too. Unless top management have their heart in it, the mobile strategy is just a bad afterthought. It still suprises me that most airlines won't accept mobile checkin or that navigating the mobile site is so time consuming on a mobile browser that it's faster to look for web access somewhere. Will Apple Approve a Competitor? Looks good. In fact this Apple iPhone application just submitted to Apple in the US looks terrific. But will Apple allow it? 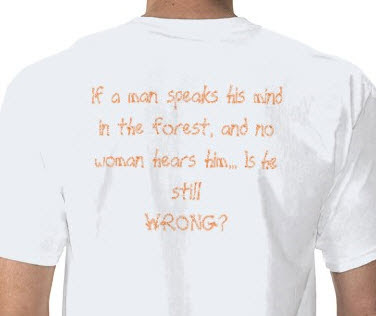 I have my doubts. Hope I am wrong. NPR's Broken Automation - Out of Service for the Summer? Been testing how some stations reply to input from listeners and viewers. Worst so far is NPR Radio in the US, which cannot read the links I sent in and makes it difficult for you to point out broken links without filling in a form that reminds me of the application form for a replacement passport. To cap it all, the message is sent from Insert Name. So what do people want to know in Uganda? I am impressed by the work Google is doing in Uganda with frontlinesms. The video editing is a bit crude at the beginning, but the main points are there. The Google blogpost explains that most mobile devices in Africa only have voice and SMS capabilities, and so they are focusing their technological efforts in that continent on SMS. Last month they announced Google SMS, a suite of mobile applications which will allow people to access information, via SMS, on a diverse number of topics including health and agriculture tips, news, local weather, sports, and more. The suite also includes Google Trader, a SMS-based “marketplace” application that helps buyers and sellers find each other. People can find, "sell" or "buy" any type of product or service, from used cars and mobile phones to crops, livestock and jobs. Google SMS Tips is an SMS-based query-and-answer service that enables a mobile phone user to have a web search-like experience. You enter a free form text query, and Google's algorithms restructure the query to identify keywords, search a database to identify relevant answers, and return the most relevant answer. Labels: "SMS app labs in Uganda"
There's quite a fan group of people collecting and remixing BBC World News countdowns. They have taken the music from the new BBC Arabic version and montaged it on the English BBC World News countdown. But the original pictures on the new BBC Arabic countdown still look more stunning than anything I have seen in English or Persian. Looks like a million dollars. May be that's why fans have started remixing it. Chinese TV seem to be launching an Arabic language channel too, although this is the quietest soft launch on the planet. I wonder whether it will be as slick, or whether people will want to remix CCTV? Labels: CCTV Arabic "BBC Arabic"
The power of recommendations...Nice promotion for why traditional media is not enough these days in developed markets. 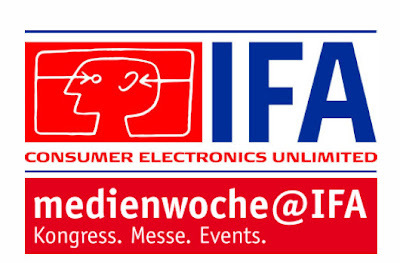 Don't look to technical blogs for coverage from this year's IFA consumer electronics fair in Berlin, Germany. The press accreditation reads like a passport application, requesting all kinds of references before they will let you in the press room with the other "journalists". Bloggers are definitely NOT wanted here only very traditional media. What on earth is the press department worried about? That they might get coverage by people who are passionate about a show that went into decline once it went annual. Truth is they won't make time to find out who are the influencers in the industry - and are totally trapped by their own routine. It takes a few seconds to check out the validity of a bloggers' claim. We remember when they were paying students in Berlin to turn up to the keynotes in a suit. Watching some of these CEO's struggle through a presentation which they didn't write is so last century. No wonder Apple has pulled out of these kinds of circuses. Labels: "IFA ist Tot" "IFA shuns bloggers"
Looking at how some radio sites are relaunching to involve their listeners more - and publish more archive material. I will wait and see with NPR, but here's a sneak peak video. Actually more interesting than the Tour de France itself. Something I said it chalked up somewhere in yellow. And will be washed away by the rain. Its the brainchild of a Pittsburg company called Deeplocal and the robot company Standardrobot. I like Standard Robot's one logo, one link website which broadcasts the message - don't bother us, we're building robots not websites. 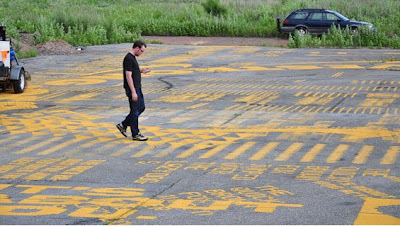 Deeplocal spun out of a Carnegie Mellon University art and technology research lab, following more than three years of research into local and collaborative information collection, storage, and visualization. They seem to have been doing some interesting projects for the BBC too. “Beat The Boss,” a well-loved British television show, pits a team of three kids, “The Bright Sparks” against a team of three successful bosses, “The Big Shots,” and asks them to create a new product that would be marketed to kids. The winner is the group that creates the product that fares the best at youth judging. Pittsburgh’s favorite condiment company H. J. Heinz Company got into the act as the client for an episode in April 2009, and challenged the two teams to create a new sauce for Heinz. The video below is fascinating. Don't be put off by the unfortunate freeze frame below. I wonder if the new Hermitage in Amsterdam will get the same sort of ideas they are getting in Bristol. Judging by the Hermitage website, the answer is probably not. Cheap radio jingles from Milan. I am sure some of the jingle companies in Holland must cringe watching this short BBC documentary on last year's jingle package for Radio Scilly, the local station for the Isles of Scilly, off the UK Cornish Coast. They are Radio Scilly on St Mary's - 107.9 MHz. But that accent on the jingles makes it sound more like Radio Sicily. But listening to the station on line, it would seem their radio heart seems to be in the right place. The Italian jingle factory that made them has less trouble with Spanish language jingles, though from the website you would think they speak Latin in Latin America. Wasn't US VP Dan Quayle the last person to get confused about this? 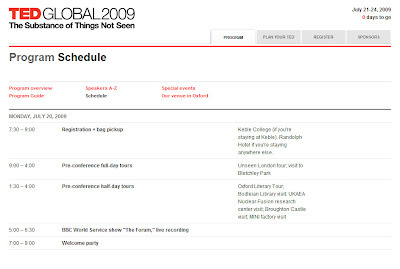 Labels: "TED GLOBAL" oxford "BBC WS Forum"
I think he could have been more effective, but the guy at zug.com does have a point. Our mobile data is far from secure. Flickr is producing some amazing work. High Dynamic photos from Rob Miller for instance. It is to be hoped that the TED GLOBAL visitors will be able to help create awareness for the computer museum project at Bletchley and the fact that the whole place needs money for restoration of the famous "huts". I hope that the TED GOBAL participants enjoy their tour of Bletchley today. I see there is a DIY ENGIMA kit in the shop which is actually designed in Holland. It is strange how we come to accept broadcast jargon in the English language. 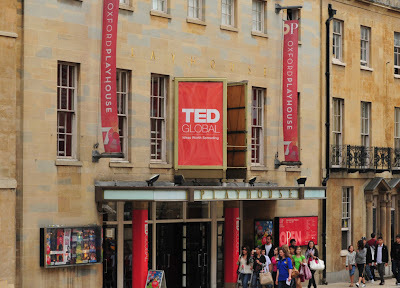 I see on the programme for TED Global which kicks off today in Oxford that the BBC World Service is going to do a live recording. Does that mean no retakes? In similar events at the FAO in Rome, the live recording was ruined at the end by the presenter being forced to do retakes for different editions of the programme with the audience still there. We were told that if we left the acoustics would change. Bridget Kendall presents The Forum on WS. It's two 28 minute segments, so I guess they must be recording material for a couple of editions today live to disc. View more presentations from tedxnwc. You knew that VHS tape was dead when Disney started giving away a free player with a set of videos. Confirmation that shortwave wireless is finished in the Western World comes when one of the two remaining shortwave annuals announces the 26th edition is uncertain. 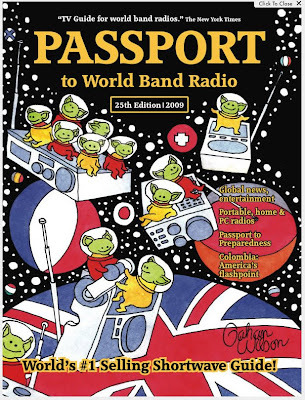 In recent months other considerations have had an increased bearing on the future of Passport to World Band Radio®. So it is that the 26th Edition of Passport to World Band Radio® is being held in limbo. Despite this, for now we are continuing to maintain the WorldScan® database and uphold all proprietary material. Among other things, this should help allow for an orderly return to production, under IBS' aegis or otherwise, should conditions allow. Can't see an orderly return to production coming anytime soon, when this kind of production has shifted platforms ages ago, despite denials to the contrary. There may be some fans of the medium left in the Western World. The problem is that that doesn't include advertisers. Labels: "Passport to world and radio" "passband"
Bored or Board - Is the BBC World Service having fun yet? So, is the BBC World Service Board having fun yet? Not by the body language radiating from this year's annual report. Most look extremely uncomfortable. 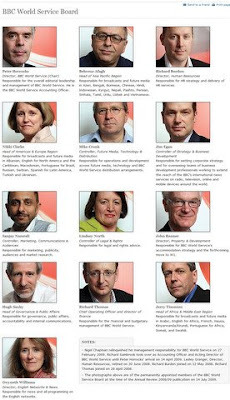 Shame - some of these people are known to be passionate about their work but the photographer has totally failed to capture any of that in the BBC WS annual report. Looks more like a UK passport photo where you are not allowed to smile any more. Why so serious? Labels: "BBC World Service Board"
Now its the turn of Microsoft to turn out the lights in a mashup tool. One of the first augmented reality apps to go live in the iPhone AppStore soon, once it's approved by Apple. Forget boring 2D tube maps! The video shows you how your 3GS phone (and it has to be the Apple 3GS) can tell Londoners and New Yorkers where their nearest tube station is via their iPhones video function. When you load the app, holding it flat, all 13 lines of the London underground are displayed in coloured arrows. 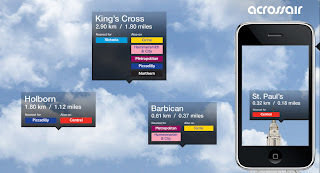 By tilting the phone upwards, you will see the nearest stations: what direction they are in relation to your location, how many kilometres and miles away they are and what tube lines they are on. If you continue to tilt the phone upwards, you will see stations further away, as stacked icons. I could have used this in Moscow and Prague last month. Especially Moscow is a zoo when it comes to the Metro and you don't realise how far apart the metro stations are. My first generation Iliad reader has just failed completely. The screen seems to have packed up along with the battery which was going anyway. Am I going to replace it with a 2nd generation Iliad for a mere 599 Euros? Er, no. Never. 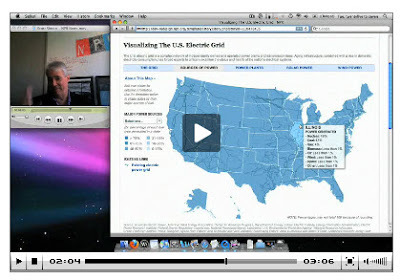 I bought one and tested it for a client, following how it was implemented by one of Holland's leading dailies, the NRC. But the device had very poor navigation and battery life and didn't do what it said on the box. If the battery failed you didn't get the last page held in memory - it just faded to a green screen. That combined with the ludicrous formating of the NRC (each article was a new page) and you couldn't cancel the paper edition. The start-up running it was slow to respond to complaints in the chat rooms, which means they didn't really care about their early adopters. Were they offered discounts when the new version came out? No. Loyalty meant nothing. 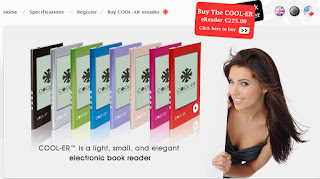 I cannot see a future for these guys in Eindhoven when there are devices like the Kindle and now Cool-er on the market. iliad is 2.6 times the price of the Cool-er and that means for me Iliad has entered a new phase. History. The Day Today was a surreal British parody of television news programmes. The series was six half-hour episodes and a selection of shorter, five-minute slots recorded as promotion trailers for the longer segments. Only six episodes were made, and were originally broadcast in January and February 1994 on BBC2. It got a bit stale towards the end - there is only so much you can do. But the problem is that it looks like many of the rolling news services that have since developed, like BBC News, CNBC and BBC World News on a slow news day. Labels: "The Day Today" "Peter O'Hanra-Hanrahan"
Be careful if you do TV graphics yourself. No that's not a spelling mistake. Great conversation about the challenge of cyberwarfare, or rather distributed denial of service attacks. I quite like the concept of bloggingheads.tv, though it would be better if you could browse by topics. Don't get me wrong, I think Vimeo has ever right to clean-up huge files which are hardly used. I have a pro account on Vimeo and have been pleased with their upload speeds - better than Youtube. Starting August 1st, basic accounts' original source files will be stored for one week from the upload date, after which they will be removed. Of course the converted Vimeo video will always be there in the Vimeo player, ready to be watched again and again, anywhere you choose to embed or share it. We will also still provide a download link so people can save the converted file to their computer (in MP4 format). This new one-week policy applies to all basic accounts' videos uploaded from this point onwards. For videos that were uploaded before this blog post, those original files will be available until August 1st, to give you some time to download them if you need to. After August 1st, those files will also be removed. For Plus users nothing will change: we're going to continue hosting your original video source files for both your existing videos and any new videos you upload. We appreciate your support, and we want to continue improving the Plus service, not limit it. If you choose not to renew your Plus service, we'll keep your original videos for one month past the end of your subscription to give you time to download your videos or decide if you want to renew. Additionally, if a basic user upgrades to Plus within the one week window after they upload a video, that original file will be kept as long as they are a Plus member. There used to be a statue of Stalin in the communist period. Joe beamed across the river from a hillside park on the North shore across the bridge and into the historic centre of Prague. The statue was removed and replaced with a sort of metronome. I climbed the 254 stairs to the top to find a skateboard park and what appears to be a sort of shrine to the late Michael Jackson. An English language broadcast by Radio Prague in May 2005 gives the background to the Stalin Statue and its rather macabre connection with death. Tourists come here today, not only for the breathtaking view but to see the large ticking metronome, which was erected here in 1991. But for the local residents this spot holds a darker memory - little do the tourists around here know that exactly fifty years ago, at this very site, some six hundred men and women were working around the clock to create the world's biggest monument ever to honour the Soviet Communist party chief Josef Stalin. The 50-metre high massive statue of the finest marble was proudly unveiled by Czechoslovakia's Communist regime on May 1, 1955. For seven years the residents of Prague had the Soviet leader follow their every move from the hill above. The 17,000 tonne statue - Stalin's jacket button alone, decorated with a hammer and sickle, of course, was half a metre wide - featured the Soviet leader in front of a line of workers - jokingly called the "Fronta na maso" or "meat queue" by Prague residents, as this was a time when they were a daily part of life in the city. There are some dark legends associated with the statue. Its creator, Otakar Svec committed suicide a day before the unveiling. The man who posed for him as Stalin - an electrician from the Barrandov film studios, failed to shake off his nickname "Stalin", took to drink, and died three years later. And, the vast statue's glory days were short-lived. Stalin's reign was denounced by the new Soviet leader, Nikita Khrushchev, and the statue was destroyed just seven years later, on Moscow's orders in 1962. Too heavy to be displaced, it was blown to pieces with 800 kg of explosives and 1,650 detonators. Some witnesses claim the party chief was decapitated immediately after the first explosion, his head rolling into the river waters below. Before the remnants of the monument were stored, they were loaded on a truck and paraded in front of cheering crowds that gathered to celebrate the event in the streets of Prague's Old Town. Was it just a coincidence or a bad omen that less than a year later, the driver of the truck died in an accident? Labels: Prague "Michael Jackson" "Radio Prague" "Stalin Statue"
BBC English Regions has been using an Internet Content aquisition vehicle. Its has been on trial on BBC Lincolnshire. Its basically an office with editing facilities on board that can be operated by a single journalist. Playing with this iPod Touch application at the moment. Kremlin Chimes from Saviour (Spasskaya ) Tower (Frolovskaya). I have listened to these bells for years in the days of Radio Moscow World Service. But I didn't realise until now that the chimes have always been built by Dutchmen. On April, 16, 1658, according to the decree of Tsar Alexey Mikhailovich, the tower was renamed Spasskaya after the Vernicle Icon placed over the gate facing Red Square. The icon itself has not survived. Russian architect Bazhen Ogurtsov (Cucumber) and English clockmaster Christopher Galloway supervised the construction of the marquee. The first clock on the Spasskaya Tower was installed by Galloway's team. In 1707, a Dutch musical carillion chime was sent to Moscow on the order of Tsar Peter the Great. That lasted a century. Ivan Butenop and his brother Nicholas, Moscow mer­chants of Dutch origin, founded in Moscow in 1830 a mech­anical workshop manufacturing farm machinery, fire-fight­ing hoses and tower clocks. From 1851 to 1852 the Butenop Brothers fully reconstructed the Kremlin chimes inside the Tower of the Savior in Moscow. For the following 15 years the Butenop Brothers mechanical es­tablishment took care of the proper operation of the mechan­ism of the chimes and the firm's craftsman wound them. Students celebrate the end of the school year in a big way in Denmark. Like hiring a cattle truck to drive through town singing and drinking. Occasionally some fall off. Not quite, but it did look like the chief TWIT there for a second on a sign very near the Kremlin. Compare this with www.premiereradio.com/.../621_show_portrait.jpg Snapped this on a very wet Sunday in Moscow. Or so we are led to believe. Love the car which I managed to capture by accident. Great exhibition of wierd signs in Copenhagen city centre. Organised by contributing editor to Lonely Planet. These are real, no photoshopping. It was cleverly organised so that toursist were allowed to take photos of the signs - and many also bought the book with plenty more inside. Organised by Kilroytravels.com in Copenhagen. An old Studer Revox is tucked under a desk at DR just incase they need to load an old audio tape into their Dalet editing system. Which isn't that often. These are solar powered garbage containers that use sunlight to compress the trash, and therefore need emptying far less frequently. They reckon an average trash bin costs 30,000 Euro to service during its lifetime. Inspiring use of daylight in the design of the new broadcast complex at Danish public broadcasting. Seems that the odd pane of glass fell out in the early stages, but that's been fixed now. Outside the main toilets at Tivoli amusement park in central Copenhagen. I note this radio is analogue not digital! Will it be converted before digital switch-off in 2015? It's finished. Too bad I couldn't see inside on this trip. Apparently still some acoustic teething troubles and bits of the organ were put in the wrong way round. But, when all is said and done, they have built one of the most amazing concert halls in the world. I also love the way they use daylight in the adjoining broadcast complex. There's a great exhibition on city lighting at the Danish Design Centre opposite Tivoli at the moment. Includes some interesting thoughts by light designers about why they don't illuminate buildings the way they do in Amsterdam or Paris. Didn't realise that both the Netherlands and Belgium are one of the worst light polluters in the world. Belgium has lit every inch of motorway and the Dutch have all these greenhouses. If the light is leaking upwards then it is not being used efficiently. In the past, the BBC has made copies of its Editorial Guidelines for Journalists available during training sessions in other countries. Now that they've set up a journalism training school, they have opened up their training to different sectors too with projects like the 21st Century Classroom. The news agency Reuters has also been training journalists from the press in developing countries though its non-profit arm. They have now released their guide to good journalistic practice here in the spirit of improving standards. It's definitely food for thought. 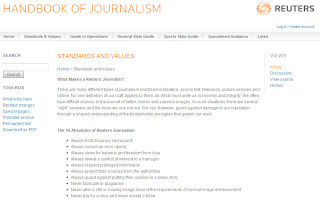 I think many broadcasters would do well by leafing through, especially the section on standards and values. They are too often "void when inconvenient". 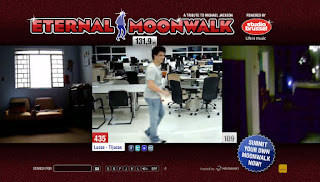 Labels: "Jackson Moonwalk" "Studio Brussel"
Boy....June turned a bit into a blur with travels to St Petersburg, Moscow, Copenhagen and Prague. Variable connectivity has meant I have put the blog on hold until I get back to the Netherlands. But I am snapping photos and shooting video like crazy. Will be writing more in July when I am back.